There is an old African proverb, which talks about trapping. Trappers sometimes set their traps by placing their food or bait inside of a jar. When the trappers approached with their nets, though the animal is faster, they were always caught. All the animal had to do to escape, is let the fruit go, turn it loose, and take his hand out. His hand is only stuck because he is so focused on leaving with the fruit to eat it, which all along, was never food, but only bait. I was reminded of this story, because this morning, I heard the word “scandolon” when I woke up from a dream. The word “scandolon” is an interesting Greek word used in the Bible. A “scandolon” was actually a trap in a pit. It was used to capture animals like foxes or wolves on farms. The way the trap was utilized best, is when the farmer dug a deep whole, large enough so that a wounded animal couldn’t get out. A bait of fresh meat was then placed into the trap. After that, the trap was placed into a pit. Though foxes are known to bite their legs off to escape traps, they’re too injured and in too much pain to leap and escape the deep pit. What am I getting at? I’ve had to take pause and look at this Trayvon Martin fiasco, and see one way this situation may have been avoided. All of this could have been avoided if Zimmerman hadn’t taken the bait, and got out of his car when he was told to stay in. All of this could have been avoided, if Trayvon had kept walking home, and not taken the bait by engaging Zimmerman until an altercation ensued. Doesn’t matter who threw what punch first. At the end of the day, tragically one person is dead, another has his conscience and life in shambles, because both of them went for the bait. They got in over their heads in a trap by the devil, and before they knew it, they couldn’t stop before it went too far, because neither let go of the bait soon enough. The English translation of scandolon is “offense.” When we get offended, it can lead into a serious trap that can overwhelm and overtake us, if we are not careful. Zimmerman was offended by people breaking into his neighborhood who looked like Trayvon; Trayvon was offended by people who looked like Zimmerman he assumed were suspicious of him. This case is loaded by the enemy, baited I dare say, to arouse offenses all the way around. The enemy is trying to instigate rioting and anarchy thru every media outlet possible, by reminding us all of times of national racial issues. Many of us are even reminiscing over personal injustices done against us, and are applying it to this situation. Speaking of the poison of offense, bitterness, the Bible says that many can be defiled by it: Enough even, to defile a nation thru rioting, etc. The enemy wants us to take the bait and overwhelm this nation with a race riot worse than anything we’ve seen. Though scandal isn’t a derivative of scandolon, the truth still remains that when we are offended by scandels, we can be trapped in a situation way over our heads. The facts are that we all have been on either side of history with these events in America. We’ve come too far as a nation, to undo years of work at race relations, simply because we choose to feed on the bait of offense in this case, and others. Offense is horrible food for your soul. We can’t feed upon the very resentment, anger, hurt, bitterness, etc., the enemy wants to use to ensnare us. Don’t take the bait by processing your pain on twitter or facebook: You’re bound to be misunderstood, and its hard, even with a “twitter rant” to convey your feelings in a substantive way for everyone to know where you’re truly coming from. If you need to process or talk this out with anyone, talk with others in person or on the phone, but avoid doing it on twitter, facebook and social media. Don’t take the bait by feeding on info in the case. Don’t buy into the media feeding frenzy of the constant barrage of information. Stay informed, but manage your time, and don’t immerse yourself in it. Now that the trial is over, the news outlets are retrying the case again, this time with vocal jurors, key witnesses which may only make matters worse: Its one thing to be insightful, and another thing to be inciting. If you must watch it, take it in doses, focus on facts, proof check information, but don’t obsess over it. 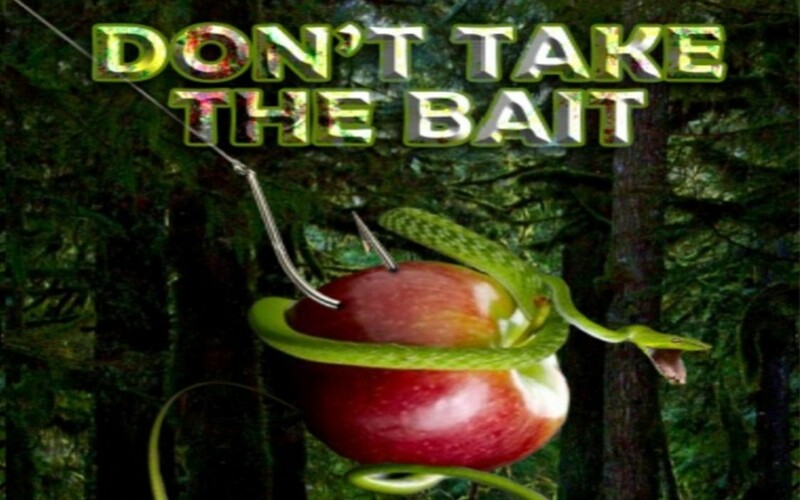 Don’t take the bait by rehearsing this event with other unjust situations or race encounters in your personal life. Don’t use your past injustices as a building block or filter to see this case through. Don’t take the bait by being quick to speak, and slow to listen. Tensions are high right now, so if you need to say anything, don’t react, but take time to process, pray and respond, if necessary. Lastly, you need to release the bait by forgiving those that have offended you; Whether it’s people in this case, or similar situations from your past. Forgive, release and let go. Forgiveness can be a process, but even if you need to do your 70 x 7, do it! Pray and be persistent in prayer, and ask the Lord to help you forgive and heal any hurts you may have. Am I saying we should bury our heads in the sand over these kinds of issues? No, but we must endeavor to maintain the unity of the spirit, and the bond of peace as we dialogue thru exercising wisdom. It can be said that because of offense, we now 2 have families, weeping over the fate of their sons. The Bible however, talks about the greatest injustice to hit the planet. In Zech 12:10, it says, “In that day, I will pour out on the inhabitants of Jerusalem and the house of Judah, the spirit of grace and supplication, and they will weep and mourn over Me, whom they have pierced, as a first born son, and as an only Son”. Zimmerman’s life will never be the same, and his parents are weeping over their son. Trayvon’s parents are weeping over the lost of their son. But the greatest injustice that has ever happened on the planet, is when Father God lost His only begotten Son because of the way we’ve treated each other in our selfishness and sin. I’m asking everyone to lay down your cry for justice, and cry out for mercy for us all. I believe that thru the spirit of prayer that God wants to pour out, he wants to replace hoodies, with prayer shawls. Of course, not speaking of a literal prayer cloth or shawl, but how God wants to blanket this nation with prayer, allowing us to be comforted by Him. He can break thru hard hearts and heal this nation. He wants to open our eyes to our desperate need for mercy, not only over what we’ve done to each other, but also for what our sins did to His Son. We can all lay our offenses down at the foot of the cross, where all of us need mercy. If mercy triumphs over judgment, I say let mercy win again for our nation. If we do this, I believe incredible fruit is awaiting us, and awakening can be furthered in America. Thanks for empowered encouraged words. thanks. god bless you. praise to the king . A very enlightened message.This is so true in each of our own lives.We are so sensitive and often react in our preprogrammed worldly view.This view is often distorted,because of our brokeness as we are a product of a fallen broken world we live in.We take the bait and cast the first stone,”We have all sinned and fallen short of the glory of God”.Because of the significanse of the cross we need to stop!!!!! and allow it to take hold !!!! of our minds and free the Holy Spirit to influence our reaction. I am a 69 year old white woman. Born and raised in the South (Alabama) I have seen so many injustices done to the Afro American community. Even as a child, I hurt for these precious ones who were being belittled, shamed and mistreated by some, not all, of the whites, (some because of ignorance, some because that’s all they ever knew and were taught, some because of misguided feelings of superiority and some because of JUST PLAIN MEANNESS). These white people must not have realized how amazing these Afro Americans were since they were raising the white peoples children, cleaning, cooking, planting their fields, building their plantations, tending the cattle and horses. Some were even fighting in their wars. What I want to say to my Black brothers and sisters, in Christ, is that God, in due season, raised up a White man, Abraham Lincoln, to bring about physical freedom. The work is not finished. He raised up Rosa Parks, Martin Luther King and many others to begin to bring about educational, economic and social freedom. Where there had been great darkness God began to bring out His “Hidden Treasures in the darkness” Isaiah 45:3 (Abraham Lincoln, Rosa Parks, Martin Luther King and too many others to mention here). We will never be able to bring about this next move of Spiritual Freedom, true equality and unity that God wants for all His people, by fighting, hating, killing and justifying our ungodly actions, by wearing crosses around our necks or clergical collars. Gods treasures always shine brightest in the darkness. Why don’t we both, Black and White, ask God to go to the real core of the problem and heal our broken hearts, as He said He would in Is.61, and bring us out of darkness and let us be His treasures, shining out for All to see, making a lighted pathway for others so that we may all walk in His light, loving each other all the way into the kingdom. Let there be peace on earth, Lord, let it begin with me. Awesome. Thank you Will Ford. It was a pleasure to meet you.